wrap for wet or dry use for the pool, beach or shower! 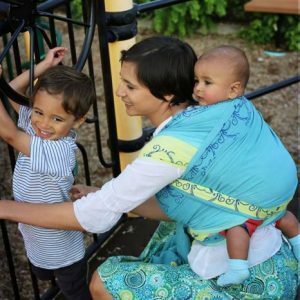 WrapDuO size 6 (4.6 meters) is great for people up to about 6 ft and 170 lbs, and size 8 (5.5 meters) is great for people over 6 ft or 180 lbs. SKU: N/A. 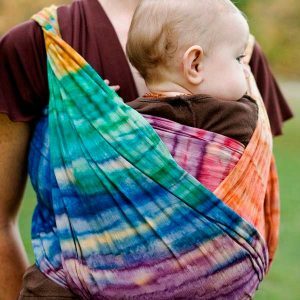 Categories: Black & Gray Wraps, Solids, Water Wraps, Wraps for Beginners. 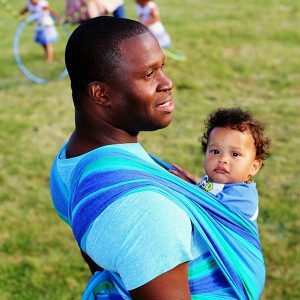 The best and original water wrap is the soft and comfortable Wrap DuO made by Wrapsody. 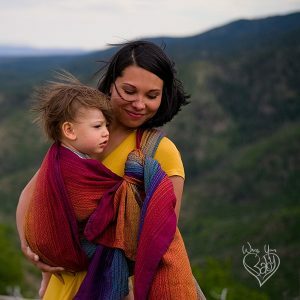 NOT HOT: Lighter than other baby wraps so you and baby won’t overheat! STRETCHY BUT NOT SAGGY: Stretchy but now with one-way stretch so it is more supportive than before and more supportive than other stretchy wraps. 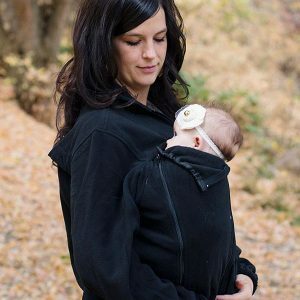 That means it will support babies and toddlers up to 35 lbs without sagging! NOT JUST FOR WATER USE: This water wrap is made from a high-tech sports knit that wicks moisture – that means it dries fast and doesn’t feel heavy. And it is great for fitness and hot weather because it wicks sweat, too! 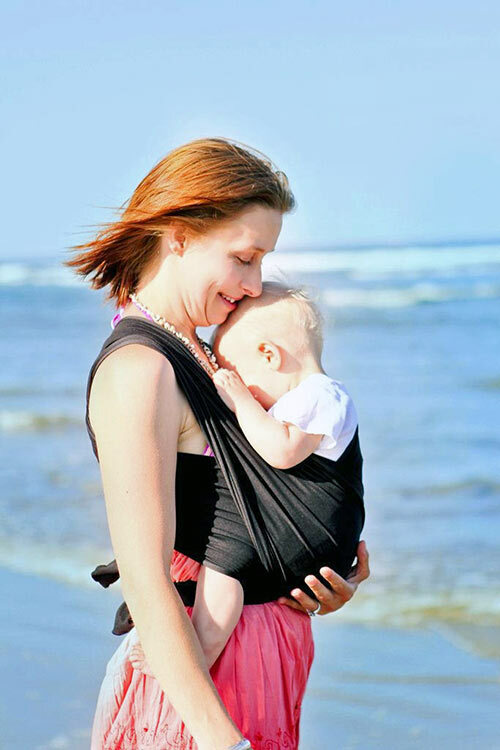 And unlike other stretchy wraps, it is lightweight so you stay cool and baby won’t overheat. 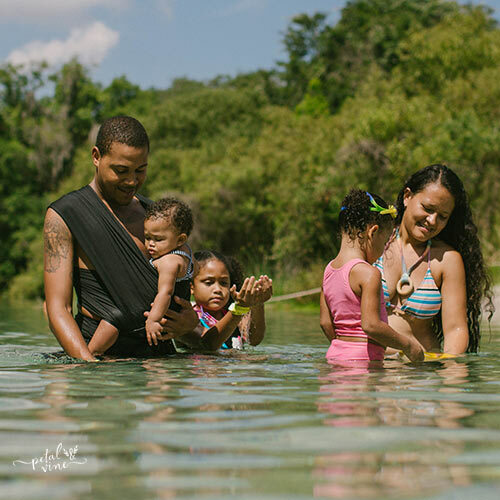 This wrap is intended for front carries only, which is the safest position for a baby in the water with you. Sorry, I cannot ship Wrapsody wraps to Canada at this time. The 100% recycled repreve yarn is sourced in the USA and is good for both the environment and the economy. The fabric yarns and technologies have been thoroughly tested to meet US and European safety standards. Even the packaging is carefully chosen — low-impact hemp-PEVA zippered bags will double as a wetbag for your wrap, and the paper inserts are printed with vegetable ink on recycled paper. Machine wash in cool or warm water (NOT hot!) 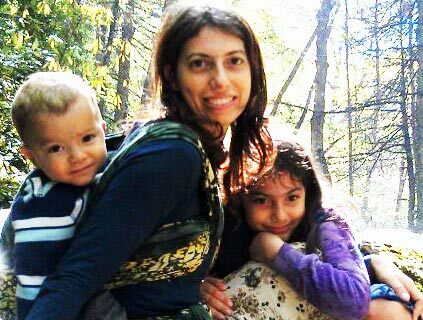 on gentle cycle. Ideally you will line-dry your water wrap, but you may also machine-dry on low heat or air-dry. If your machine is a top-loading machine with an agitator, secure your wrap in a pillowcase or mesh sweater bag before washing. This will keep the fabric from wrapping tightly around the agitator and becoming strained, which would cause premature wear or even damage in your fabric. If you are machine drying, do so separately from other clothing to avoid tangling. Size 6 (4.6 meter length) is a good choice for people up to about 6 ft and 180 lbs, and size 7 (5.5 meters) is great for people over 6 ft or 180 lbs. 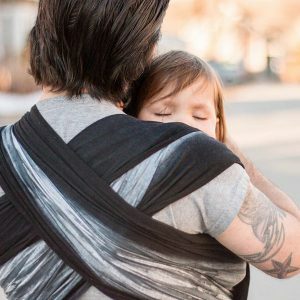 WrapDuO size 8 is 5.5 meters, standard length for a stretchy wrap (like the Moby wrap) and about four inches shorter than size 8 in some woven brands.